The Brewers’ magic number to finish with a better record than the Cubs is down to 27. The two teams begin a four-game series tonight at Wrigley Field. It is the last time they play each other this year. Each Brewer victory during the series will lower the magic number by two, so a sweep would bring the magic number to 19. If Cubs manage a sweep, it will remain unchanged. At least it is for my Brewers. The A’s and Mariners played two games in Japan last week, Miami and St. Louis christened the Marlins’ new stadium on Wednesday, and a good chunk of the league began the season yesterday. Today, the Brewers and the other remaining teams get their start. They open up at home against the defending World Series champion St. Louis Cardinals (1-0). That championship came at Milwaukee’s expense, in a heartbreaking repeat of 1982. So the rivalry is a little more intense than it was this time last year, even though Tony LaRussa, Albert Pujols, and Prince Fielder have all moved on. By my calculations from Wikipedia’s handy formula, I put the Brewers’ magic number to clinch their division at 163. Any combination of Brewer wins and Cardinal losses adding up to 163 makes the Brewers NL Central champs. It is far, far too early to be calculating this kind of thing, but that’s precisely why it’s so much fun. This blog will be keeping an eye on the magic number throughout the season. 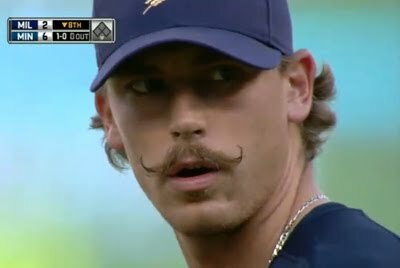 The Wall Street Journal has a nice profile of how mustachioed Brewers closer John Axford crawled, clawed, and climbed his way to success in the big leagues. The article doesn’t show it, but Axford is known for his wry sense of humor, which is one reason why he fits in so well in what may be baseball’s loosest clubhouse. It started in an empty clubhouse in Chicago, where a few repeated whispers of “Bob” had the announcer wondering where the sound was coming from. Uecker kept hearing his name and after walking through the clubhouse, he eventually realized that it was coming from Morgan’s locker. He looked inside and found the player hiding behind all of his clothing with a huge grin on his face. Meanwhile, Steve Rushin has penned a lovely paeon to the city of Milwaukee and its baseball team. 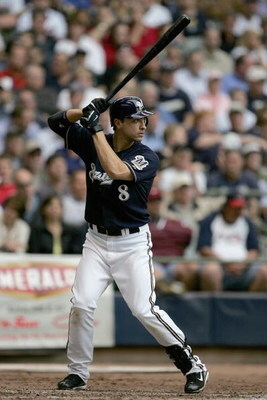 This week, the Brewers will play a series against the Yankees in New York for the first time since 1997. The New York Times used the occasion to profile Ryan Braun. It’s worth a read; very rarely does a player of his caliber stay with a small-market team for an entire career. Braun signed a contract extension earlier this season to stay in Milwaukee through 2020, when he’ll turn 36. This fan wishes there were more like him. 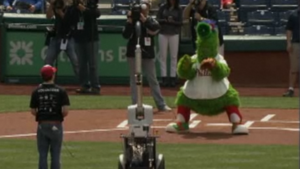 In what is believed to be a baseball first, a robot threw out the first pitch at yesterday’s Brewers-Phillies game in Philadelphia.